Wrought iron fences add a classic aesthetic to your property. What is not to love about wrought iron fences? They make a bold statement, are very durable, and feature great privacy and security measures. Generally speaking, wrought iron is a small carbon composite that is extremely strong and bendable. 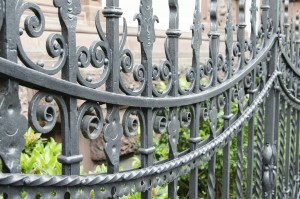 Wrought iron fences require little maintenance and will show little signs of wear and tear for several years. If wrought iron fences are built in a damper environment that is susceptible to long periods of heavy rains, wrought iron fences may develop some rust spots after time. However, the rust spots can easily be fixed by a small coat of paint or by applying sandpaper to the affected area. It is recommended you touch up your wrought iron fence every three to four years or do a major repaint and overhaul every 10-15 years so all of the above mentioned can be done during that time. Wrought iron fences are offered in a variety of shapes and sizes and are constructed to represent more than just a property barrier. Wrought iron fences are an outstanding and beautiful complement to any traditional or modern home exterior. It is characterized by elaborate and defined curves, scrolls and twists and can be found on every street corner outside the more Victorian homes in portions of England and other areas of Europe, North America and other areas of the world as well. When you are ready to think about selling your home, wrought iron fences also may increase the value of your property because they do not totally block out scenic views and can add pleasant curb appeal. Another reason that we love wrought iron fences is because of the additional safety feature they provide. Wrought iron fences are the ideal choice to keep your children and your pets safe. Wrought iron fences also act as a great barrier for privacy and are perfect for defining your property line from your neighbors. Since these kinds of fences are more flexible, it is imperative to choose a style that small children and pets or even intruders can easily bend to escape out of or enter your property. Additionally, wrought iron fences are also a nice addition to safeguard and decorate the outside of your swimming pool. If you endure a problem with your wrought iron fence or part of it breaks down, it is important and quite nice to know that you will not have to replace the entire fence. A small or large portion of the fence can be completely repaired without having to do an entirely long and complex revamp of the wrought iron fence. This entry was posted on Thursday, December 31st, 2015 at 7:27 pm. Both comments and pings are currently closed.